In the very early nineties I bought an album that completely knocked me over. Initially just buying the album; being a total guitar freak, for the participation of amazing guitar player Vivian Campbell, who already made quite an impression on Ronnie James Dio's albums. The vinyl I am referring to was the surprising debut of the band Riverdogs. Expecting an album which should be focussing on Campbell's guitaristic escapades, the real surprise came from the wonderful blues infused music and even more, the amazing voice of vocalist Rob Lamothe. The band's line-up was completed by bass player Nick Brophy and drummer Marc Danzeisen. After the self-titled debut Campbell chose to move on to Foreigner's Lou Gramm's new band Shadow King, before accepting the guitar spot in Def Leppard. Riverdogs continued with Brophy as guitar player and continued to release melodic rock albums with a fair amount of blues and even singer songwriter influences. Early 2017 the word was that Riverdogs would release their latest album in the same line-up as their infamous debut. The big question today is, can a band that impressed me so much in 1990, give me the same kind of goose bumps twenty seven years later. I guess the obvious answer is “no”, just because the band created a kind of expectation, when they announced this reunion and basically, you can't re-live the feeling when you get knocked out by an album. But what is the album California like, as a reunion record? My impression, when I load the disc in my player for the first time is very confusing; the album opens with American Dream, a track that I didn't see coming. 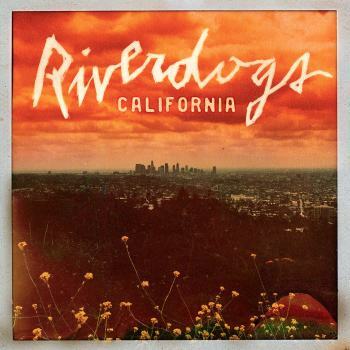 Eighties melodic rock and hair metal and lyrics that I did not expect from Riverdogs. Vocally, way too mediocre to make a good first impression, although the tasteful solo gives me the first smile. In a way the album gets turned inside out when it continues, The Revolution Starts Tonight hits a different note, the bluesy feeling is back and Rob Lamothe excels with his amazing voice. Gone is the feeling the first track gave me and the sphere of the illuster debut album slightly returns. Something Inside takes you to the blues, the kind of melodic blues that would really suit on an album of Joe Bonamassa; great vocal parts and emotional guitar combined together. During Golden Glow first indications are there, the kind of feeling you get, when you are listening to something special. I guess it's the total package, but for me the vocal guitar combination is brilliant. The following You're Too Rock And Roll enhanced the feeling and the melodic bluesy ballad The Heart Is A Mindless Bird just confirms my feelings of listening to a great album. Guess I really missed the inspired guitar playing of Campbell. After this moment of tranquillity Riverdogs cranks this up a bit, Searching For A Signal is a positive rocker, filled with solid drums and strong guitar parts that lay the foundation for Lamothe's nice vocals. Welcome To The New Disaster and Ten Thousand Reasons bring back the laid back Bonamassa feeling of earlier tracks, but add more drama and passion. Catalina is a nice rocker with an awesome solo and the final track I Don't Know Anything is another trademark track, combining emotions, melancholic vocals and laid back guitar parts. The reason I really like California. The conclusion after several listens is that I again get excited about what the original line-up's came up with. The melancholic songs are just brilliant and the addition of the first track is the only reason I can't grant them with the maximum stars. In the end a blond bleached jerk is responsible for the mixed feelings I get when I listen to American Dream. A dream that seems to slip away even more every day.